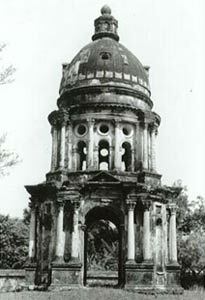 This ruined Mosque was built by Azimunnisa Begum, daughter of Murshid Kuli Khan and wife of Nawab Suja-ud-daulla. Like her father she was buried under the staircase. The only remaining arch of the Mosque indicates that it was profusely decorated. The large raised plinth and the exterior bay of the east facade of the mosque remain. It was built in 1734 AD. There is an inscriptional slab in the eastern entrance to the mosque. 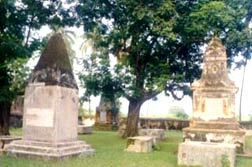 Surrounded by a low enclosure wall and having numerous graves with memorial pillars and epitaphs this huge European Cemetery is one of the historical relics of Baharampur. In this Cemetery are the graves of many English Residents amongst whom most famous were Captain James Skinnon, George Thomas, Henry Creigton. There are a number of epitaphs attached to the tombs and monuments. End of the 18th and beginning of the 19th century AD. 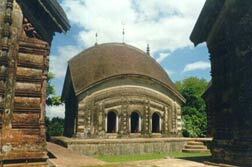 Situated within a courtyard a group of four Siva Temples of do-chala type on high platform. The temple walls contain exquisite terracotta ornamentations. Mid eighteenth century AD. 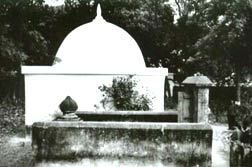 This tomb of one of Siraj-ud-daulah's Generals is situated in the compound of a tomb of a Fakir named Farid. It is an ordinary grave with a head stone within walled enclosure. Mid 18th century AD. 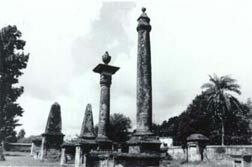 The Cemetery contains 47 tombs and obelisks etc. and the oldest being that of Daniel Van der Muyl who died in 1721 AD. A number of epitaphs are found on the tombs and obelisks. The handsomest which bears no inscription, is a tall structure with two piers of pillars supporting a cupola. Early 18th - 19th century AD. This Cemetery contains several tombs and graves including the tomb of Mary Hastings, wife of Warren Hastings and that of her daughter. This single domed brick-built Mosque with a square prayer chamber and a verandah on the front was erected by Rafa't Khan in 1495 AD during the reign of Alaud-Din Husain Shah on the basis of two inscriptions on the mosque. Within a walled compound are situated the tomb of Alivardi Khan, a square flat roofed building inside which the grave of Alivardi Khan, Sirajuddaullah and other family members remains. 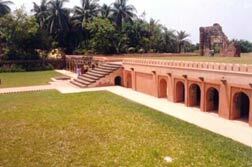 In the sprawling compound with a garden are located a mosque and tombs of others. Mid 18th century AD. 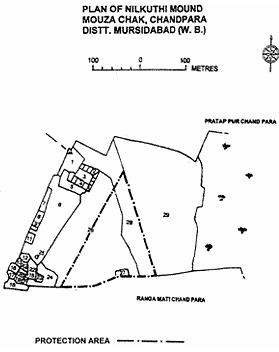 It is one of the possible group of five Mounds indicating the remains of a Stupa as signified by the word 'Panchthupi'- the name of the locality. The Mound is nearly 20 m. in diameter the exposed portions of which shows bricks of large size. 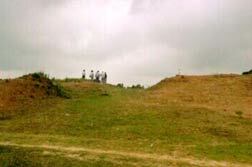 The Mounds locally known as Rakshasidanga and Raja Karna's Palace (RAJBARI DANGA) have been excavated by the Archaeological Survey of India and Archaeological Department of University of Calcutta respectively. 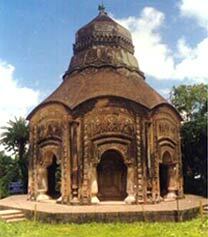 The discovery of a terracotta sealing by the University of Calcutta bearing the legend Raktamrittika Mahavihara has identified the location of the monastery bearing same name described in the accounts of Hiuen Tsang who visited the palace in first half of the 7th century AD. 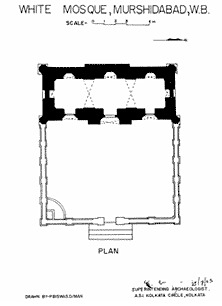 A wide area contains vestiges of ancient remains datable to c.2nd century AD to 15th - 16th century AD at present. 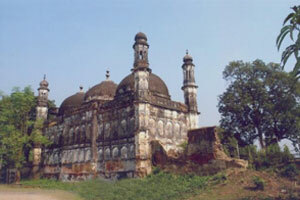 Within a walled compound stands a brick-built three domed Mosque on the north-western corner and the rectangular Mausoleum of Shujauddin with a small verandah in front. 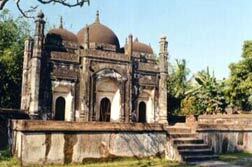 According to an inscription on the tomb Nawab Shujauddin constructed his mausoleum in 1738-39 AD. The mosque was possibly erected by Alivardi Khan. This Mosque known as Katra Masjid was erected by Nawab Murshid Quli Khan who lies buried under its steps. Erected on an elevated platform with an open courtyard surrounded by double-storeyed cells, with four massive Minars at four corners with staircase inside, it commences a special style in Bengal. The mosque was built in 1723 AD. 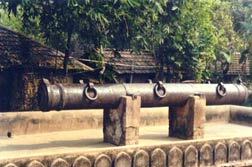 This inscribed cannon is popularly known as Jahankosha or the world subduer. 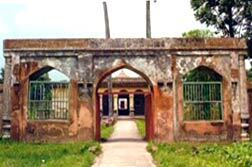 It was cast at Jahangirnagar (modern Dhaka) by a Bengalee blacksmith named Janardan during the reign of Shahjahan. 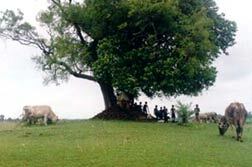 It is 5.5m in length and more than 7 tonnes in weight. There is an inscription in the cannon recording its date 1637 AD. 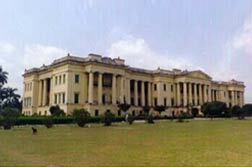 The Palace is popularly known as Hazarduari Palace as it contains about thousand real and false doors. 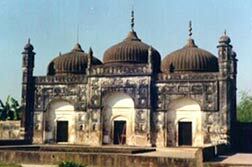 It was built by Nawab Nazim Humayun Jah (1829-37 AD). 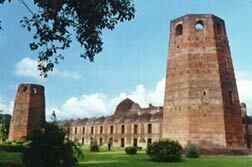 The palace was used for holding Durbar and as residence of high ranking English Officials. Now it has been converted into a period museum. 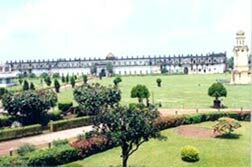 It has presently twenty galleries displaying a vast array of interesting exhibits which include life size paintings of the Nawabs of Murshidabad, British royal personages, period furniture, landscape paintings, silver thrones, palanquins, arms and armour used in various battles of this region, vases, ivory and marble objects etc. The Imambara lying opposite to the palace is a vast building with a Madina at the centre. 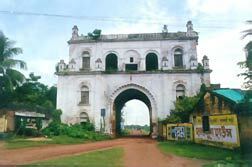 This massive Gate is the entrance Gateway to the Killa-Nizamat situated at the south side. It was built probably during the period of Nawab Walah Jah in the year c.1821-24 AD. 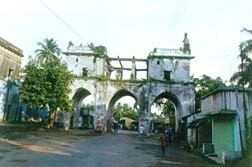 This Gate is called Dakshin Darwaza or Southern Gate and is surmounted by a Nawbat Khana where royal instruments were played. The entrance is large & high enough for an elephant to pass with howdah on its back. 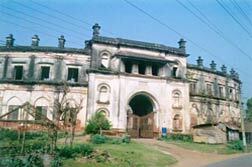 Built in 1847 by Nawab Nazim Feradun Jah Imambara is situated parallel to north facade of the Hazarduari Palace. This imambara is divided into three large quadrangles the central one is called 'Madina', plinth of the raised floor which is decorated with ornamental china tiles. The eastern hall of the central portion is called as the Mimber Dalan corresponding to the west and east room all paved with polished marble are the repository of 'Tazias', Alam and Panjas of gold, silver and standard, encased in cloth embroidered with verses from the Quaran. 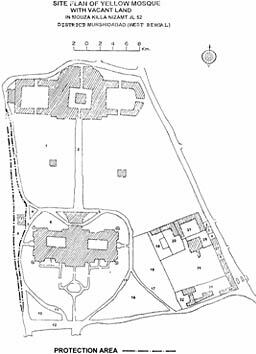 The two other quadrangles are equally spacious. 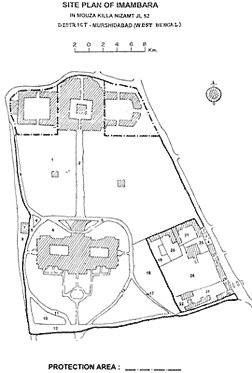 The eastern quadrangle is reached from the streets, through a big gate which is surmounted by a "Naubat Khana". The western quadrangle terminated in a two storied Mosque, standing on the mint Ghat. 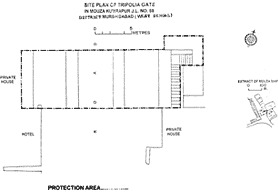 The enclosures are entered through seven large gates. Besides this there are two inner gates as large between the quadrangles. This Mosque is situated near South Gate on the bank of river Bhagirathi with foundation wall running deep into the embankment. It is known to have been built by Nawab Siraj-ud-Daula in the year c.1756-57 AD. It is washed by white colour hence known as the "White Mosque" or 'Safed Mosque'. The Zurad Masjid or 'Yellow Mosque' is situated within a few metre from the Hazarduari Palace on the bank of river Bhagirathi. It was said to be built by Nawab Siraj-ud-Daula in the year c.1756-57 AD. 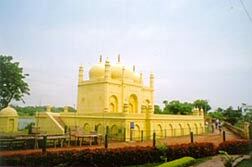 It is washed by the yellow colour and locally known as "Yellow Mosque". The Tripolia Gate surmounted with Nawbut Khana is a massive Gate with three arched ways situated to the east of the Palace. It was built by Nawab Suja Khan (c.1725 to 1739 AD). 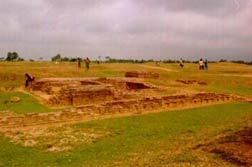 The site is situated at a place adjacent to Rajbadi Danga and is hardly 1 Km away from the centrally protected Mound known as Raja Karna's Palace. 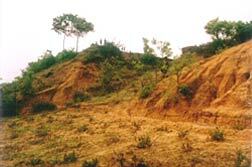 The Mound is on a higher elevation from the surrounding level and numerous potsherds, normally datable to the early centuries of Christian era and later period are available. There are reports of the sporadic findings of antiquities from this region. The triple dome mosque has a three arched façade. The flanking ones are blind. According to local saying, Nawab Alibardi Khan used to come regularly to the mosque to offe rprayer. His eldest daughter Ghasati Begum adopted Ekramulla ,the younger brother of Siraj-ud-Daula, as her son. When Ekramulla died at a young age, Nawaej Muhammad Khan, the husband of Ghasati Begum could not bear the shock and died shortly afterwards. Both of them were buried side by side in the precinct of the mosque. 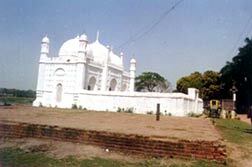 Motijheel Mosque, which stands adjacent to the western bank of the Motijheel, was built by Nabab Nawaej Muhammad Khanin 1750 A.D. 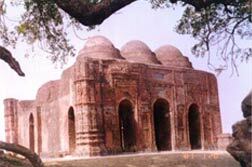 He named it as Kala Masjid, which now well known as Motijheel Mosque.